Irmgard C. was born in Berlin, Germany. 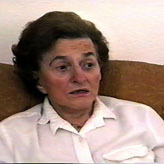 She and her family experienced increasing antisemitism after the Nazis took control of Germany in 1933. 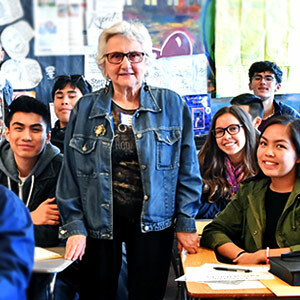 After Kristallnacht, her family left Germany for Shanghai on a Japanese ship. She discusses her life there, her work, and the changes after the Japanese restrictions began. She and her family left Shanghai for the United States soon after the war ended. Irmgard describes her excitement about leaving Germany to meet a Shanghai-bound ship in Italy. Q: Where did that ship leave from? From Italy. I forget the name of the town, but it was from an Italian [town]. We went through Rome. As a matter of fact, there was a guy on the train who showed us Rome for a day. And then we – I don’t know what harbor that was anymore, but that was the ship we left on. We stopped on the road; the problem was we didn’t have any clothes, because we only left with suitcases. Our papers hadn’t come through. Q: You didn’t have papers? No. Our papers said we could take certain amounts of clothes, and certain amounts of furniture. You know, some people took a lot of furniture, and some people took a lot of money. Q: Did your father try to take money out? No, he would never do that. He would not. I wanted to. I wanted to take jewelry, too. I always said, let’s take it and then if there’s somebody coming on our train, let’s throw it out of the window. But he wouldn’t do that. Q: Did you have any trouble crossing the border out of Germany? We didn’t know. We parked about three or four hours up on top and one guy out of [everyone on] the train was called out. I don’t know why he stood there, and he was shaking. Why they called him out, I don’t know. They didn’t call out anybody else, and after three hours we left and the train went through Italy. But that was just luck because some trains they didn’t do that with. They investigated everybody, what they took out. So what if we would have taken out some rings or something? Well, my father wouldn’t have done that. Q: Now, did you feel that you were leaving your country? I don’t think I was old enough to think it was sad. It was good to get out because it was dangerous. People were disappearing. Jews were disappearing out of our house. And it was a big house where we lived. We lived in an apartment. Everybody in Berlin lived in an apartment. And a couple of guys, they had lost, had already left or been left.